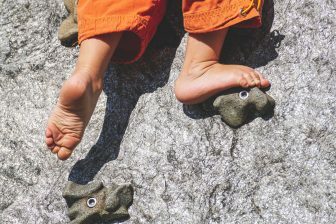 By donating free and accessible playgrounds, the Brazil-based ALPAPATO Project is creating valuable opportunities for children – both with and without disabilities – to connect through play. Julia Zvobgo, Community Manager of Child in the City, spoke with co-founder Rodolfo Henrique Fischer about the genesis of the project, lessons learnt and why he’s not a fan of the word ‘inclusive’. ALPAPATO (Anna Laura Parques Para Todos) in Portuguese translates as ‘Anna Laura Playgrounds for Everyone’. Rodolfo Henrique Fischer and his wife Cláudia Petlik Fischer created this project as a tribute to their daughter Anna Laura Petlik Fischer who died in a car accident in 2012 when she was almost four years old. The idea was planted during the couple’s trip to Israel shortly after Anna’s passing. It was a trip they had intended to take with Anna. While in Israel they were shown some accessible play equipment, which made Claudia wonder: “Do we have that in Brazil?” It was a question Rodolfo could not answer. When he returned to Brazil he decided to investigate, and soon realised there were very few playgrounds equipped with accessible facilities. They decided to put that right with their own resources and with a goal of building and donating three to four playgrounds a year. In 2013 the ALPAPATO Project was established and the first playground was donated in São Paulo in 2014. Rodolfo Henrique Fischer and Cláudia Petlik Fischer during the inauguration of the first playground. The playgrounds they have built house several toys and play equipment that enhance play and promote inclusion. Some of them are their very own creations. 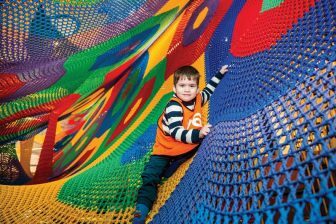 They create them with an open design to spread the culture of accessible playgrounds. 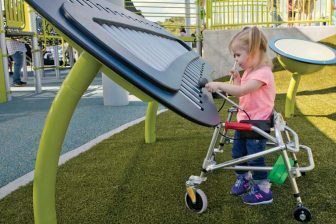 Every piece of equipment they design has its own objective, such as therapy, sensory stimulation or promoting interaction and play between children with and without disabilities. The International Play Association (IPA) sees Rodolfo and Claudia’s playgrounds as a prototype. Rodolfo stressed that the equipment is accessible, but not inclusive. In fact, he would prefer everyone to discard inclusive from their vocabulary because it promotes what he calls ‘otherness’. “All children have a right to play and belong and it is up to us to create spaces that are accessible to them,” he says. So far the couple have donated six playgrounds and are in the process of creating three new ones. The Grasshopper. The feature image is also of the Grasshopper but in another playground in Natal, North of Brazil. 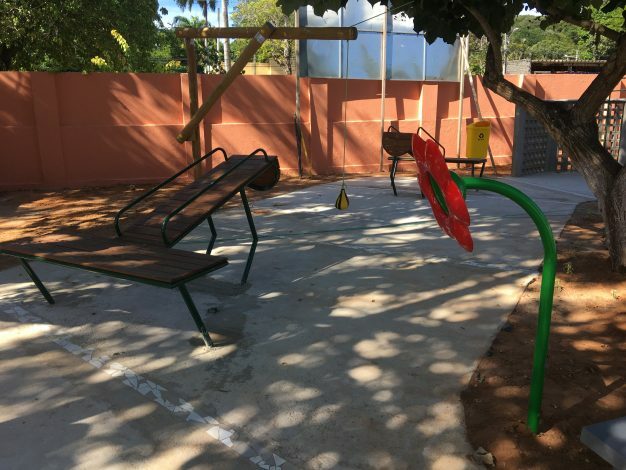 The first playground they donated was to the Association for Assistance to the Deprived Child (AACD), one of the largest institutions in Brazil that focuses on deficiencies. They subsequently received numerous requests from other organisations and institutions, and so established a board to review requests and decide to who and where to donate the playgrounds. Two of the six playgrounds have been donated to municipalities, something in Brazil which can sometimes be a challenge for several reasons. First, the playground can be used as a political tool by a mayor to get votes, and secondly when there is a change in leadership the new officeholder may not want to maintain a park that was donated by his or her predecessor. Another related project Rodolfo and Cláudia have initiated is Pais em Luto (The Mourning Parents Project), which provides free support and services for low-income grieving parents. Through the project that started in 2016, grieving parents unable to afford a psychologist or psychiatrist can receive counselling and have access to treatment. Psychologists and Psychiatrists donate their time to make the program possible. Rodolfo has also written a book, Em Nome de Anna (In the Name of Anna), another therapeutic project but more focused on his personal journey. Even though it is a personal story the book connects to the pain of all the parents who have lost their beloved children. In remembering and honouring their daughter’s life Rodolfo Henrique Fischer and Cláudia Petlik Fischer are transforming playgrounds and creating a dialogue about mental health and accessibility.